"Ken Galipeau's extraordinary talent as storyteller and singer mesmerized the Mendham Township Elementary School student body during a day-long stay at our school. Ken interacted with five small groups of students throughout the day during our school-wide Enrichment Day, telling them stories and having them sing along. 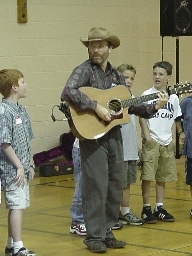 As a culminating assembly with all the 1st-4th grade students, Ken entertained the children with more stories and songs, having the same small groups of students perform with him. It was an outstanding, entertaining performance!" * Stories and songs in small intimate group settings. Which could include question and answers on storytelling. Were each group is divided by grade or class. * Stories and songs in small intimate group settings (as above). Followed by a school wide assembly. * Stories and songs in small intimate group settings (as above). Students then rehearse a story or song to assist in telling of that story or song in a school wide assembly at the end of the day and/or an evening performance for families. This could be singing a chorus, assisting in hand motions, individuals or the group delivering lines during a story or song. * Week long residency on teaching kids to tell stories, optionally culminating in a school assembly or evening family program. Here the children would do the storytelling. NOTE: This could also be done once a week over a 5 to 6 week period. This would be geared to grades 2 and up. 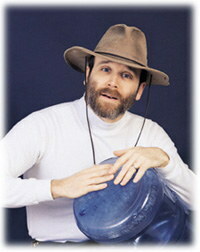 * Write a song with the kids and optionally record it and/or perform it in a school assembly or evening family program. NOTE: This could also be done once a week over a 5 to 6 week period. 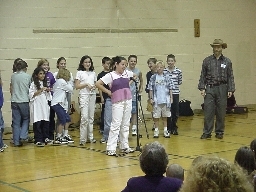 * Children's performances can be recorded and later sold by the school as fund raiser.